I closed my Twitter account yesterday. I had it open for about 8 months. Before I joined I was decidedly anti-Twitter but by the end of it I actually really liked it. It was a challenge to write something in only 140 characters. I participated in a daily poetry prompt to begin with but then I just began engaging in conversation with my fellow Tweeters. There are some really great people on Twitter who are funny, entertaining and just plain profound. I already miss many of them. So why stop something you really enjoyed, I hear you ask? The time difference was one. Most of the people I followed lived in the northern hemisphere so I was up to 18 hours ahead of them. I was constantly missing out on the gist of conversations and there were many things it wasn’t even worth responding to because it was so long after the fact. I also had a problem with people who tweeted more than ten things in a row in the course of a minute. I like haiku as much as the next person but I don’t want to read your ten versions of haiku based on the word boat. No offense. The main reason, however, is time management. Twitter is great for those of us with procrastination in our blood. It’s fun and it can be a good way of keeping abreast of current events, but it really does add to the amount of time you spend online. Recently, I have felt that I don’t devote enough time to getting the projects finished that I need to finish – like my novels. Oddly enough, they are not going to write themselves, so I really need to bite the bullet and get them done because I am becoming increasingly aware of how quickly time marches on, of how easy it is to make excuses; and I don’t want to look back when I’m fifty and wish I hadn’t wasted all that time. So something had to give. And it was many of the items in my Google Reader – no more messing about with the LOLcats and their ilk – as well as Twitter, that got the chop. Bye bye Twitter. I will miss all the friends I made there and the great chats I had but it’s time for me to get serious. Interestign to hear you say that, I’ve resisted Twitter despite being able to see value in it because I’m just not into small talk and to be honest I would want my haiku to go somewhere other than Twitter….. I have got into Facebook and Myspace though and find they’re very useful and not too time consuming. Actually having said that, I spend a lot of time now at gigs and poetry readings that I wouldn’t have known about if it wasn’t for FB and Myspace, so maybe indirectly they are time consuming! I’m proud of you for making this decision. I’m not a huge twitterer, but FB takes up waaaay too much of my time. I am putting myself on the wagon next week. I didn’t even attempt Twitter. I am a Facebook junky and that is enough time wasted. Anymore and I’d get nothing done at all. It’s funny, but I’ve been pondering the same thing, although I just can’t seem to pull the plug. At first, I liked using it as a writing tool, you know, “make a story fit into 140 characters.” Then it was the poetry prompts that were fun, until someone unfollowed me and I realized there wasn’t much point of writing the poems if the person running it wasn’t even looking. Ok, now I want to go kill my twitter account. Maybe I’ll have some coffee first, then decide. I just ‘un-followed’ someone who used to put up 15-20 tweets in a row, most of them plugging his bloody book! But, on the plus side, someone DM-ed me and offered me a commission! Oh I am sad to see you go. I have warmed to Facebook and actually use that a lot more although my blog remains my favourite online place to be – well, not just mine, yours and others too. I never had any interest in joining Twitter or Facebook. I don’t have enough time in the day as it is, let alone taking on anything else. I think you’ve made a good decision Sel. We only have so much time to devote to what matters. So much of our days can be swallowed up by things that don’t really count. I’m glad you are moving forward with your writing. You have such a gift! Not to be negative or critical about Twitter. I know that a lot of people really enjoy it. I just knew from the get-go it wasn’t for me. Happy Weekend Sel. Hope to “see” you soon. I miss your tweeting already, Selma. I find twitter so useful for sharing links, that is mainly what I use it for, but your tweets were lovely. I find Twitter inane. It strikes me as quite odd that I seem to gain a follower a week when I rarely, if ever, Tweet. Facebook would be tougher for me. It’s rather like a celebrity magazine except that it’s about people I actually know and care about. I’m not much for the games, etc., but I use FB as my email and as my main contact mode with so many “real” friends. I’ve never been on Facebook or Twitter because I spend way too much of what little spare time I get reading blogs and keeping up with my own. If I got involved with those two things as well I’d feel chained to the computer. Not good. I like being outside in the fresh air too much. I’d say that’s time-consuming in a good way if it’s getting your work out there. I’ve resisted joining Facebook and I won’t join simply because I know I’ll use it to while away the hours instead of writing. Sometimes I am tempted, though….. I hope you stay on that wagon. Unless you really enjoy it and have the time to spare for Facebook. I just don’t have the self-discipline to do both, so I have to cut certain things out of my life completely. I know exactly what you mean. I read a lot of blogs which I want to keep doing, so something had to give. I don’t know how people find the time to work, look after kids, Facebook, Twitter, blog. Sleep, eat. Is it possible to reconcile the online and offline worlds? Sometimes I’m not so sure! I hear ya. That unfollowing episode really got on my goat. Very uncool. I think Twitter is a really good writing challenge and it is good to interact with people you know, but the spammers, people trying to push their barrow and so on, spoiled it for me. I’ll be interested to know if you pull the plug! That is great news! I know what you mean about the book pluggers and so on. I guess there is a marketing aspect to Twitter that is unavoidable. But all I want to do is have a chat! I prefer blogging above all. I thought about just taking a break from Twitter and keeping the account open, but I really just wanted to make a definitive decision and a clean break. I will miss you too, especially hearing about your lovely boys! Twitter does have a lot of positives, but for me it is just an excuse not to get any work done. I know what you mean. I sometimes felt a bit of pressure to come up with something to say so my enthusiasm for it was beginning to wane, anyway. Blogging is where it’s at! 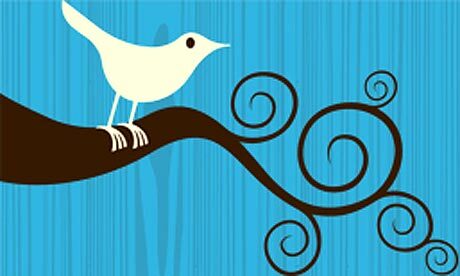 Tweets for my Tweetie. I will miss YOU heaps !! Thanks, hon. I really do appreciate that. And Twitter is very handy for sharing links! It sounds like Facebook has a lot of benefits for you. That’s great. To my surprise, it was quite hard to give Twitter up, but today I feel better about it and know I did the right thing! Me too. If I didn’t get outside I’d have nothing to write my blog posts about. Twitter just can’t compare to blue skies and birds flying on the horizon. i need to spend more time here…. You are definitely welcome here anytime. It is in fact, a treat for me. And i think you might be right about my soul !! Twitter seems bizarre to me. I can’t for the life of me figure out the fuss. But, then many people think that of blogging. So, I shouldn’t be too judgemental. Still…….. I spend enough time online, the last thing I want or need is another avenue to explore! Plus, I’m too damn wordy. I found Twitter to be quite good fun, mostly, but it did stop me from getting my work done. I miss the immediacy of chatting to people but I will just need to catch up with everyone via blogging from now on. And yes, I can totally relate to being wordy!! From what I know about these things, which isn’t much, it just doesn’t make sense to me… posting one’s rambling thoughts as if someone was interested really leaves me shaking my head… but what’s even worse are those people that hang off every word of someone’s rambling thoughts as if they were important. Hang on… I’ve just described blogging haven’t I… ummm, I’m going now. This is a real shame. Twitter is a great social n/w tool and I can’t imagine not using it on a daily basis. Ofcourse it will never replace my blog but it’s still a great way to communicate online. You couldn’t stink more than me. I’ve tried and I just can’t write poetry. Actually, I thought many of your poems were very good. I liked your perspective. It’s really just a time thing with me and Twitter. I actually miss it quite a lot but I waste so much time online as it is that I do have to take a stand. Unfortunate, but true. I know you’re just too polite to say it, but the real reason you nixed Twittter is because I was always tweeting without pants, wasn’t it?! I’m SOOORRREEEEEEEEEE!!! I can change, I promise! I am all for pantless tweeting. In fact, if there was a society supporting it I would be a member. I am so sorry to not read your tweets anymore. You are an absolute character. Don’t ever change, you are one in a million, Vahid.